Think about the last time you cut your finger or stubbed your toe. These experiences have a very specific context which conjures up associated emotions and feelings. When you cut your finger, you likely remember the object that caused the cut: a knife, a piece of paper, a sharp piece of metal. You may recall a particular smell in the room or even the background noise of the environment. You may recall the time of day, the weather, whether you’d cut that finger before, the amount of blood, the degree of pain you felt and more. Finally, you remember the outcome. Did this event affect your life in any way? All experiences - even seemingly small ones - are a sum total of your senses, thoughts, past experiences, expectations, beliefs and more. Each experience is intimately connected to the emotion and context of your actions. If you’re a construction worker, you may experience cuts on your hands each day, which may diminish the importance of a single event. If you’re a violinist, a cut to your finger may be a rare and frightening experience - one that could affect your stage performance and limit your ability to do your job. The moral of the story is: context matters! The same event is perceived differently by each person, and even differently by the same person in different points in their life. The ability to quickly assign meaning and purpose to experiences is crucial for making snap judgments in a situation. However, there’s a downside to this unconscious feedback loop from action to reaction. When someone makes a quick judgment, they must create a story about the event based on their past experiences and current expectations. The individual details of the experience are often lost through a series of generalizations. Over time, this can desensitize or over-sensitize someone’s response to an event. Explaining the complexity of these experiences to those in pain can be quite difficult. The words we choose and how we use them have an immeasurable impact on a patient. Thought viruses have the potential to worsen a patient’s prognosis, and the opposite is also known to be true. Learning to educate patients through positive affirmations or through friendly and understandable language can positively impact a patient’s outcome. Think of this much like a thought vaccine or thought remedy. Using disc herniation example, instead of discussing the imaging findings in depth, a better approach would be to educate the patient on the strength of their spine and the poor correlation between pain and disc herniations shown on imaging. You may follow up with analogies or stories that paint a positive picture in regards to healing and that describe pain in terms of an alarm that is sensitive rather than a direct correlate of tissue damage. each system was put into its own silo and treated as if it were completely independent of the others. However, the truth is, all of these systems work in tandem every moment of every day to maintain homeostasis. Homeostasis can be defined as the stable condition of an organism and its internal environment, the maintenance or regulation of stable conditions or simply, as the balance of bodily functions. Because of this constant interplay between every aspect of self, human beings are much like a complex ecosystem in which all parts depend on one another to create a harmonious symbiotic relationship. In the example of an ecosystem, it’s evident that changes to that ecosystem can create disharmony. manufacturing plant may cause great stress to all the organisms living in the ecosystem, affecting its overall health. The list of possible stressors and ways an ecosystem can become out of balance is endless. Similarly, every system in the human body plays a role in helping to combat stressors and maintain homeostasis. Issues such as pain, injury and sickness often emerge when there are too many stressors placed on one or several systems. This overload of stressors forces the body out of equilibrium. These stressors can fall into separate but equally important physical, psychological and emotional categories. However, just like most ecosystems, humans are wonderfully resilient and it usually takes more than one of these scenarios to drive the system out of homeostatic balance. Often, addressing just one or two of the stressors leading to dysregulation can have a dramatic and positive effect on the health of the entire ecosystem. Each time a stressor is managed, the ecosystem - as well as the human body - gains strength, allowing for an easier return to homeostasis. Imagine you’re walking through a beautiful forest with a dear friend. It’s a sunny day and the perfect temperature for a hike. There’s a cool breeze, and you can smell the crisp scent of the evergreens. Your friend is walking behind you and the two of you are engaged in great conversation. Suddenly, you feel something poke the back of your arm. Thinking your friend tugged at your sleeve, you look back to see a trickle of blood - you snagged yourself on a thorny vine. “That kinda hurt,” you think to yourself, “but a vine isn’t dangerous - no harm, no foul.” You wipe the blood away and continue hiking. Now imagine that you’re walking alone through the woods at dusk. It’s a cold and foggy evening, and the sun’s setting quickly. You’ve taken a wrong turn and can’t remember which direction leads back to your car. Earlier that day, your friend warned you not to go hiking after dark in these woods, reminding you that one of the most poisonous spiders in the country builds its web between the trees after sundown. If one of these spiders bites you, it could mean grave danger. Suddenly, you feel a prick on the back of your arm. The prick increases to a sharp stab, and now you feel a burning sensation. “Oh no, it’s one of those spiders,” you think to yourself, “I’m done for!” You run into the woods, quickly stopping to check the damage the spider’s done your arm. Relieved (and a little embarrassed), you see it’s nothing more than a thorn from a vine. This story demonstrates how context, beliefs and prior experience always play a role in influencing how much or how little pain someone experiences. Next time you’re experiencing pain, think about some of your common beliefs surrounding your pain. to the temperature. Before long, your skin is no longer in pain, and you’re in a relaxing oasis of bubbles and jets, the discomfort a mere afterthought. So what happened? The water is still the same temperature. Your core temperature is still rising. Yet those feelings of discomfort diminished even though nothing about your experience with the water changed. Why was getting into the hot tub only temporarily painful? There’s a multitude of complex biological processes that could have occurred within the nervous system to cause this change. Regardless of the exact combination, it’s evident that you experienced pain from a stimulus that didn’t cause you harm; there was simply the potential for harm, had the temperature been hotter. Erring on the side of caution, your brain gave you a warning alarm of pain until it concluded that there was no longer an imminent threat. *story is actually written about co-author Jim Heafner PT, DPT, OCS and his younger brother John. Two brothers are sent outside by their parents to do chores, one of which is to water the garden. While the brothers love being outside, they don’t have the attention span to stay focused on their chores. The older brother gets distracted by playing a trick on his younger brother. While the younger brother waters the garden, the older brother sneaks over to the hose and slowly bends it in half, the water pressure dropping to a small trickle. As the younger brother raises the nozzle to his face to inspect it—WHOOSH—the older brother releases the kink and the water blasts the younger brother in the face. In this analogy, the nervous system functions similarly to the garden hose. Just as the garden hose delivers water, our nerves are responsible for feeding the muscles, joints, skin and other soft tissue. If the garden hose becomes kinked or compressed, the amount of water flowing through the hose is reduced. Your nerves respond in a similar fashion. If nerve pressure or irritation rises to a certain level, blood flow to the nerve and electricity through the nerve, known as the axoplasmic flow, is interrupted. This alters the amount of nutrition through the nerve and leads to an aggravated state. The nerve’s response to reduced nutrition can be a vague array of symptoms, mostly commonly described as numbness, burning, heaviness or tingling. To improve nerve nutrition, you must improve the flow of electricity and blood in the nerve. This is accomplished through gentle and specific movements and exercises. Fortunately, just as the garden hose returns to full function when the kink is released, nerves also respond favorably to the decreased compression and increased movement. From professional athletes to musical entertainers and beyond, these high-energy performers execute complex motions with relative grace and ease. Whether it’s LeBron James dribbling down the court or Bruno Mars dancing on stage, their coordination and precision are due to the incredible motor control and movement pattern memory they’ve gained through countless hours of training. In your own body, think of this “muscle memory” as an internal GPS that’s aware of every movement you make. When an injury occurs, your internal GPS is often reprogrammed to make you move in different ways. With an injury, there can be different messages sent between the brain and the muscle, meaning your “muscle memory” has been disrupted. After some time, your internal GPS may no longer be able to accurately identify certain roads on your body’s map. While the injury is healing, the brain and body often coordinate alternative, compensatory strategies for certain movements like a limp, awkward bending mechanics, stiff movements, or limited range of motion. These protective phenomena are much like how a GPS detours to an alternative route because of a road closure. 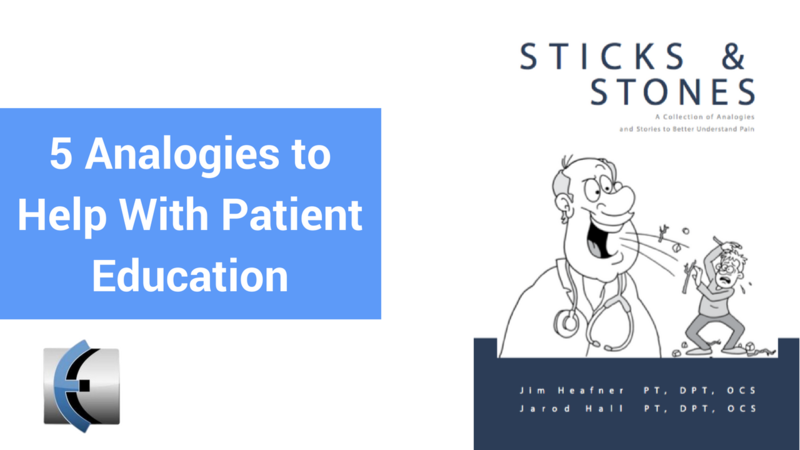 Using analogies, metaphors or stories can be a simple strategy to help the patient best understand their current issues. The average individual doesn’t understand the complex interactions of the brain and body, but an analogy or metaphor gives them a relatable concept to grasp. It offers a patient the opportunity to connect their situation with a sensory and emotional experience they can relate to. We hope you can use our top 5 stories to better explain the complexities of the pain experience and how to reframe pain to match the context of the individual person. We hope you can translate these stories into your own language to lessen suffering while forging a path to recovery. For these stories and over 40 more, we encourage you to check out our book Sticks and Stones - click on the learn more below to check out the ebook!